Efficient management: ASUS Commercial BIOS Kit for easy customization of DMI, BIOS values and boot logos, plus Intel® ME Driver and OEM Activation (OA) tools. 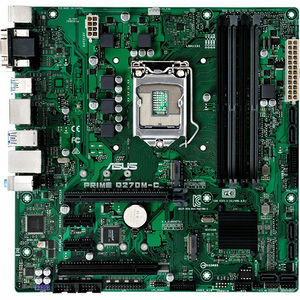 ASUS is the world's biggest and best-known motherboard brand, renowned for our user-focused Design Thinking. We understand the business importance of stability, easy manageability and security. That's why ASUS commercial series boards include, 24/7 stability, smart BIOS tools and guaranteed long-term availability, and our world-class after-sales service effectively reduces many hidden costs of ownership - maximizing your investment over the product lifecycle. Maintain the best performance and prolong system lifespan. Customize, monitor and update your systems with automated ease. Avoid pin damage and benefit from consistent layout across product generations. Prime 200 motherboards are engineered with industry-leading 5X Protection III, employing the finest components, excellent circuit design, and exacting standards to guarantee the quality and long-term durability of your motherboard. That means exceptional protection and stability for your build - thanks to decades of engineering experience from the world's leading motherboard brand. Precision control for stable power!